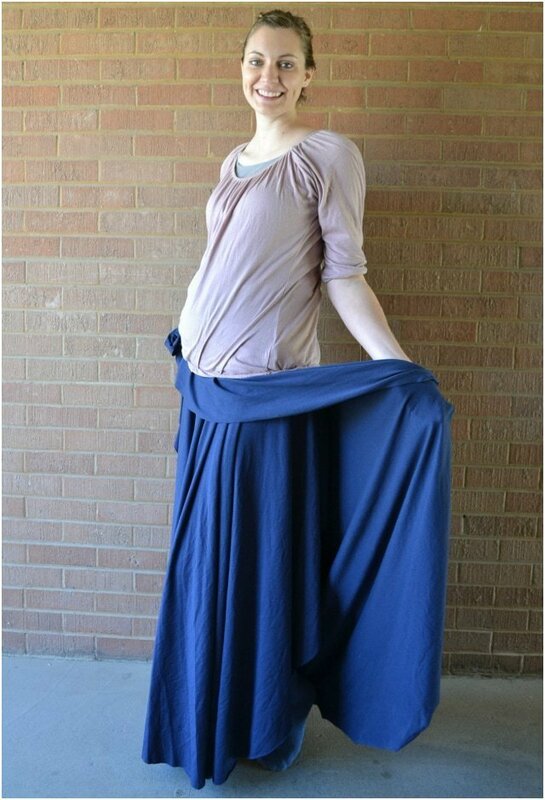 I’ve had an idea for a circle wrap skirt developing in my head for the last couple of months. I wanted to make a skirt that was easy to make, adjustable for changing sizes, and mom-friendly. 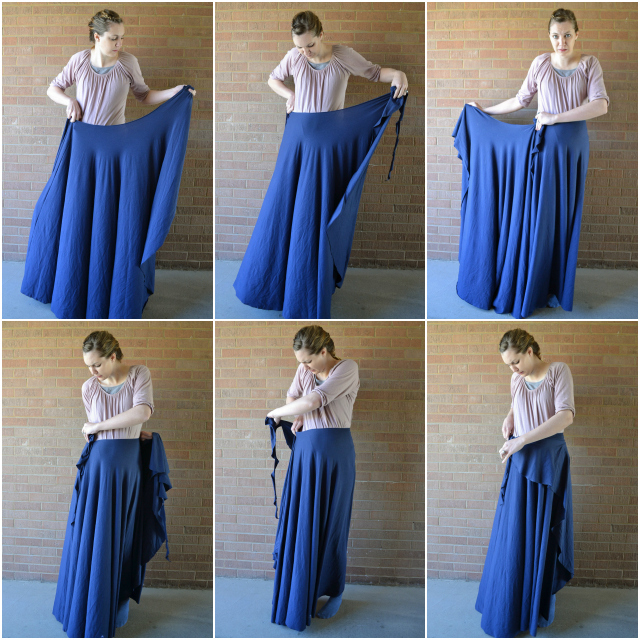 I was able to make a wrap skirt tutorial that is all of these things!This skirt is so adjustable that it can fit a multitude of sizes, and you can still fit in it if you’re changing sizes! It’s really quick because there is only ONE SEAM to sew, and there are no hems or edge finishes! If you lift up the overlap there’s a layer underneath so you’ll never flash anyone. 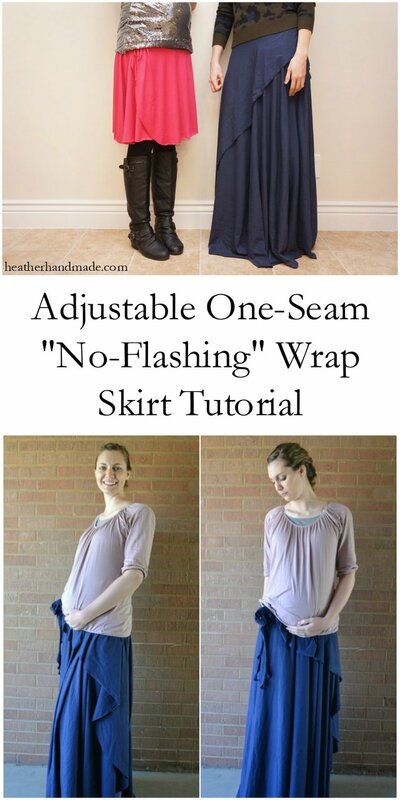 Enjoy this wrap skirt tutorial perfect for any size and lifestyle! Even when I lift the part the overlap, nothing is uncomfortably flashed underneath! I wore this skirt all throughout my pregnancy when I’m changing weight constantly, and I even wore it during postpartum when I’m changing weight constantly. 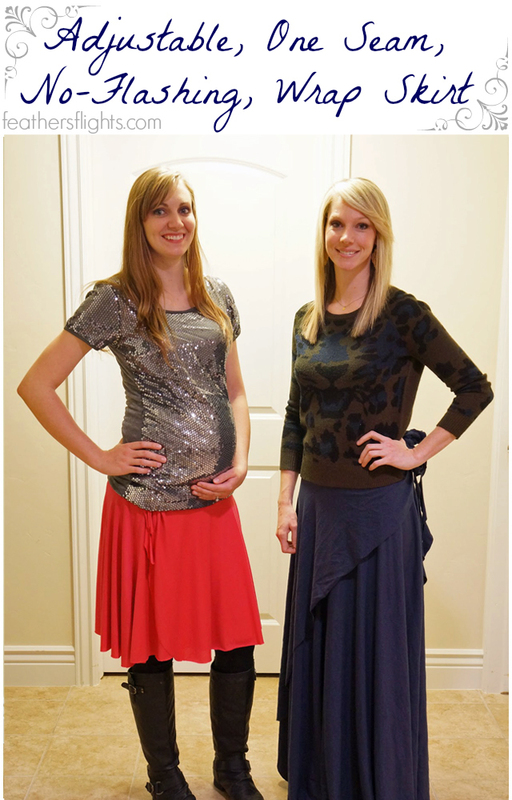 My SIL and I wore the same navy wrap skirt even though I was pregnant and she was not. Our waist measurements were not close, but we were able to wear the same skirt. It’s a magical skirt! Place a measuring tape at your center back waist and let it hang down. Decide how long you want your skirt to be, and have someone check what the measurement is. This is your skirt height measurement. Measure your waist or where you want your skirt to sit. Wrap the measuring tape around your waist and make sure it’s horizontal with the ground. This is your waist measurement. Find your radius for the inner waist circle by using the chart below. 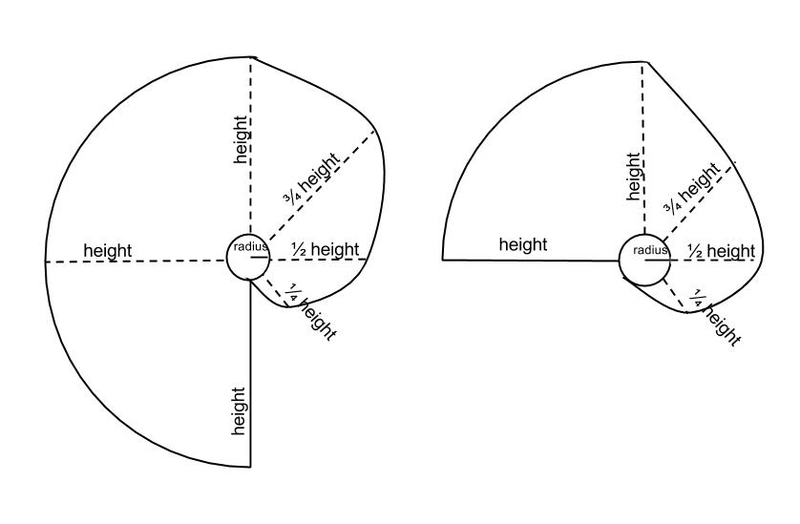 Here is a simple chart for quick radius measurements. Pick something in between or the next measurement up. 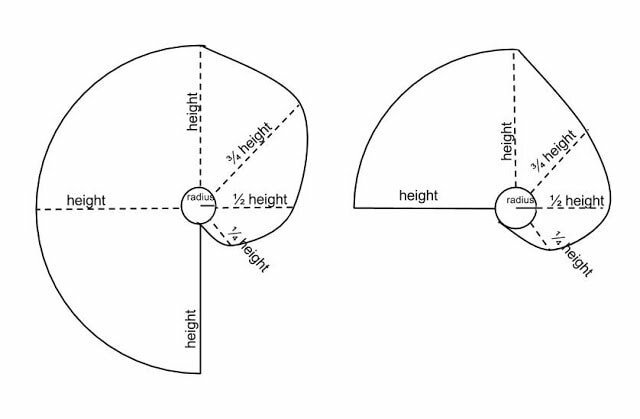 Use this diagram to cut out your skirt. 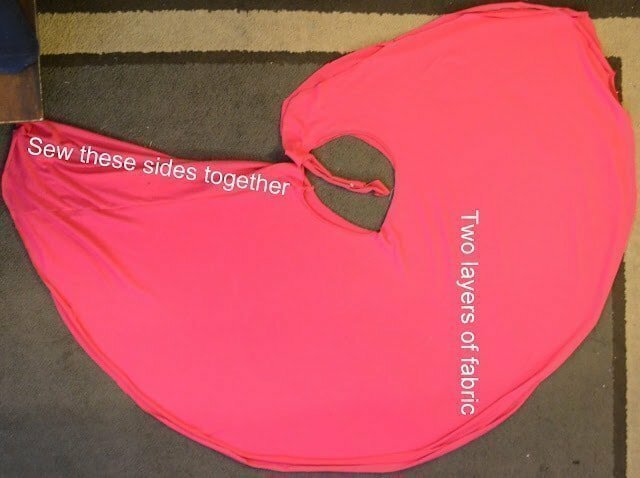 The diagram on the left is a full circle skirt and the diagram on the right is a half circle skirt. Choose just one! You will need two cut two of one diagram but make sure they are opposite of each other. Use the measurements you found to get a custom made skirt that fits your body! Using diagram cut out two pieces of the half circle skirt or the full circle skirt. Make sure they are opposite of each other when you cut them out. Sew the one long seam with a skinny zigzag and right sides together. Don’t worry about finishing any of the edges. Jersey fabric gets a nice, soft, rolled edge when left unfinished. Find the seam and put it on one side of your waist and hold it there. Grab the side that will go across your front and warp it all the way around until it meets with the seam. Hold the seam and one wrapped side with one hand on one side of your waist. Grab the other side and wrap it around your back to the front until it meets with the seam. Your two ends that tie will meet over your seam. Tie them in a bow or knot. 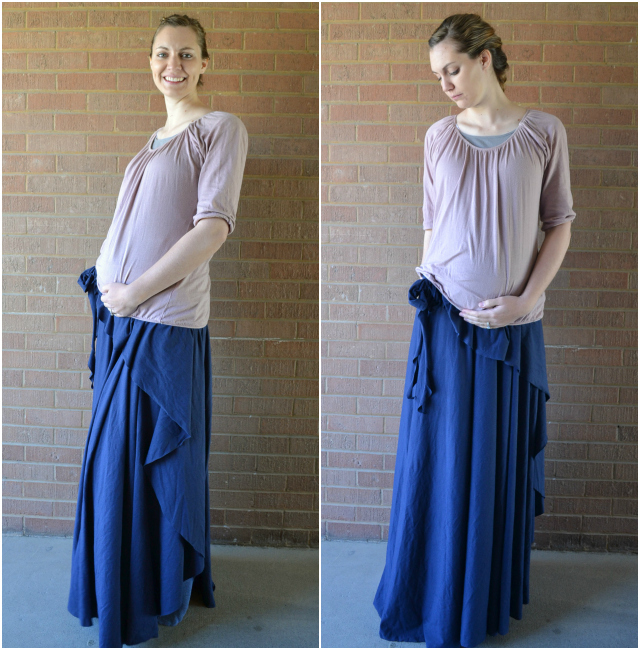 This skirt is very comfortable and works throughout and after a pregnancy. 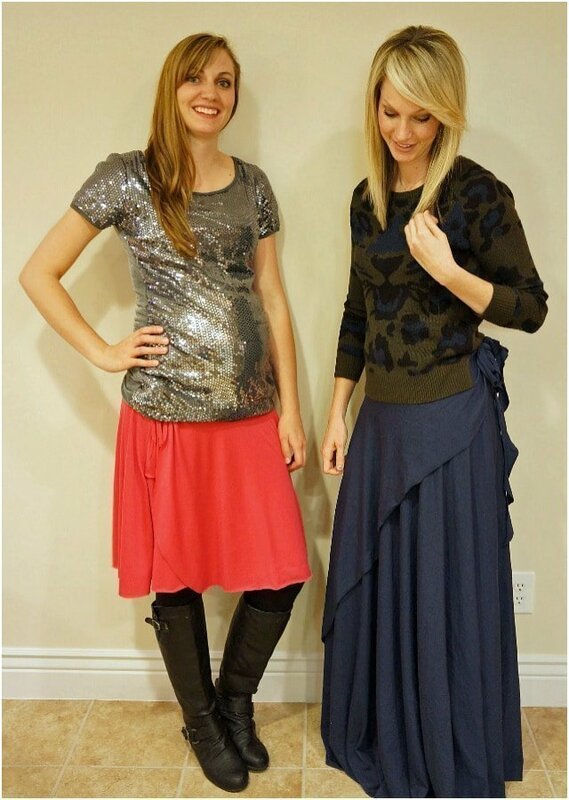 The navy blue wrap skirt was worn by me AND my sister-in-law who definitely isn’t pregnant. You’ll get lots of compliments, and you don’t even have to tell them how easy it was for you to make! You can play with the length for a fun maxi, midi, or mini skirt. 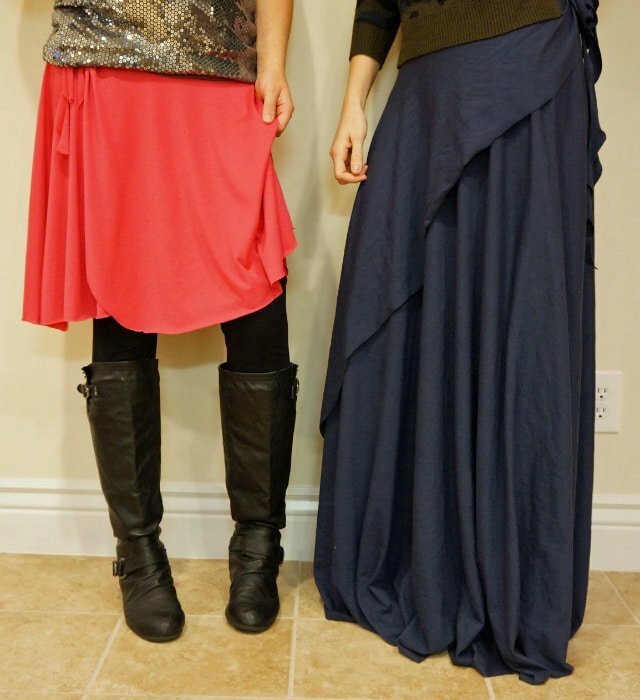 What kind of skirt would you make with this wrap skirt tutorial? This is perfect. I’m in the “losing the baby weight” phase and need something adjustable. I will be trying this out this week. Thank you! Great! I’m hoping to make a video of this tutorial in the next month! Could you do the two layers in different colours? So when you wrap it, the bottom layer is one colour and then the other part that wraps around it at the front will be another colour? Where is the seam that you sew? Is it hidden on the side opposite to the ties or can you possibly see the seam (and subsequently the abrupt change in colour)? The seam is in the center back so it would abruptly change colors. You could just wear a different color underneath though! Please clarify the tie portion of the instructions. I don’t see two “ends that tie”. The instructions say to “waist circle, cut a short tail from the inside circle for the tie. * ”, but what about the other side, is there a tail to cut there too? When you are cutting a short tail from the inside of the circle you are cutting two layers of fabric. You will be cutting two ends that tie at the same time. Does that make sense? I just wish there was a video tutorial, because I have no idea how to make them. I am a little confused about some of these instructions. You put "You will need two of each for one skirt." yet there is only one seam you need to sew. Do you mean one of each circle design for one skirt or two of one circle design for one skirt? Love it, and it's going straight to my really have to do list!